From New York to Oregon, many are cheering on the recent wedding between mandolinist Chris Thile and acress Claire Coffee. The two reportedly tied the knot in a nuptials ceremony at Blackberry Farm in Tennessee on Monday, December 23. The project film makers are thrilled to announce that HTGAB is coming to DVD, BluRay and online Digital formats. This week launched a campaign on Kickstarter to make a DVD and BluRay of How To Grow A Band. If this campaign reaches its goal, your pledge will fund the creation of a limited-edition, two-disc set packed with bonus features not available anywhere else. New York, NY --/PRNewswire/ Sony Masterworks celebrates another record-breaking week in cellist Yo-Yo Ma's career with the sales and chart success of The Goat Rodeo Sessions . The newly released recording, featuring the talents of cellist Yo-Yo Ma, bassist Edgar Meyer, mandolinist Chris Thile and fiddler Stuart Duncan, debuted at #1 on the Classical, Classical Crossover and Bluegrass Billboard chart. In a rare industry occurrence, its second week of sales surpassed the first with an increase of 37 percent. It currently sits at #18 on the Billboard Top 200 and at #11 on Soundscan's Digital Album Chart – Ma's highest placements on each of these charts to date. This is a major achievement for Ma who has released over 75 albums (16 Grammy Award winners and 1 Latin Grammy) in the past 30 years. New York, NY -- Thanks to a fortuitous "goat rodeo," Sony Masterworks is releasing The Goat Rodeo Sessions, a landmark album project by four of the great instrumentalists in music today, on Monday, October 24, 2011. The album uniquely showcases cellist Yo-Yo Ma, bassist Edgar Meyer, mandolinist Chris Thile and fiddler Stuart Duncan. While each musician is a renowned superstar in his own music sphere, they have come together now as a unified ensemble on a most remarkable and organic cross-genre project stemming from their friendship, and the title concept. The album also includes two vocal tracks featuring Thile and guest artist Aoife O'Donovan, the lead vocalist and writer for progressive bluegrass group Crooked Still. 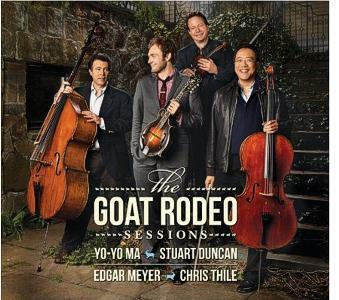 New York, NY -- Thanks to a fortuitous "goat rodeo," Sony Masterworks is releasing The Goat Rodeo Sessions , a landmark album project by four of the great instrumentalists in music today, on Tuesday, October 25, 2011. The album uniquely showcases cellist Yo-Yo Ma, bassist Edgar Meyer, mandolinist Chris Thile and fiddler Stuart Duncan. While each musician is a renowned superstar in his own music sphere, they have come together now as a unified ensemble on a most remarkable and organic cross-genre project stemming from their friendship, and the title concept. The album also includes two vocal tracks featuring Thile and guest artist Aoife O'Donovan, the lead vocalist and writer for progressive bluegrass group Crooked Still.